Review by AllTheBestFights.com: 2017-10-14, fight not so exciting between Giorgio Petrosyan and Chris Ngimbi 2: it gets two stars. 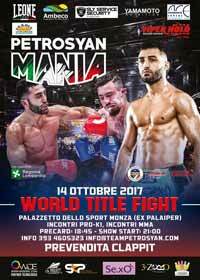 The former Glory and K-1 World Max champion Giorgio Petrosyan entered this fight with a kickboxing record of 85-2-2 (38 knockouts) and he is ranked as the No.3 super welterweight in the world. ‘The Doctor’ Petrosyan suffered his second defeat of his career during the semifinal of the Glory lightweight tournament against Andy Ristie in 2013 (=Petrosyan vs Andy Ristie), since then he has won nine bouts beating Artem Pashporin (=Petrosyan vs Pashporin) and Amansio Paraschiv in 2017 (=Petrosyan vs Paraschiv). His opponent, the 2016 SuperKombat Mw champion Chris Ngimbi, has an official record of 30-20-0 (9 knockouts) but he lost three out of his last five bouts, the last one with Amansio Paraschiv; before this fight he had beat Paraschiv winning the SuperKombat title. In their first bout Petrosyan beat Ngimbi via unanimous decision (April 26, 2008); this second fight, main event of PetrosyanMania 4, is valid for the ISKA super welterweight world title. Watch the video and rate this fight! 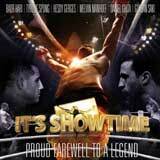 Review: 2012-06-30, good final rounds between Andy Souwer and Chris Ngimbi but it is not enough to get three stars. Andy Souwer (143-12-1) entered as the No.10 super welterweight in the world while Chris Ngimbi (24-12-0) entered as the No.18. Souwer vs Ngimbi is valid for the “It’s Showtime World Title 70 Kg max”; undercard of Peter Aerts vs Tyrone Spong (It’s Showtime 57 & 58). Watch the video! Review: 2012-01-28, pretty fight between Harut Grigorian and Chris Ngimbi but unfortunately it was stopped due to cut: two stars (fight ended by TKO in the second round). Chris Ngimbi, ranked as the No.18 super welterweight in the world, entered the fight with a record of 23-9-0 while Harut Grigorian had a record of 39-7-0. In their first fight (October 24, 2009) Grigorian defeated Ngimbi by decision; Grigorian vs Ngimbi 2 is on the undercard of Badr Hari vs Gokhan Saki 2. Watch the video! Review: 2011-05-14, the match between Chris Ngimbi and Willy Borrel was the best fight of “It’s Showtime Lyon” and also one of the best K-1 fights of 2011. After a good first round, in the second Ngimbi knocked down Borrel with a left hook and a few seconds later knocked out his opponent with a flying knee: devastating KO! In this fight Chris Ngimbi defended for the first time his “It’s Showtime world title” (70 kg max), which had won against Murat Direkçi in 2010. Watch the video!